Now, in addition to your portrait, you want to add some information about your professional life. The task is to draw what you are doing and working with and turn it into a pictograph. This can be products, services, people etc. 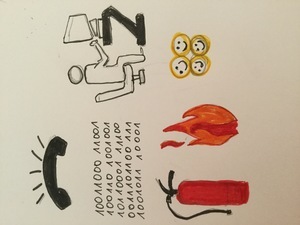 Remember the pictographs unit, and if you need help always check out https://thenounproject.com/. 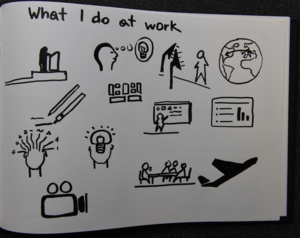 "I turned to the pictographs representing “what I do at work”. It is a wide selection of different lecture and presentation related icons, as well as icons for creativity and new ideas. Also traveling and filming is included, as well as the business model canvas, representing one of many tools I am teaching. Having to choose pictographs is not easy as it forces us to really reflect what we do and stand for and what we also want to communicate to other people. I ended up with more pictographs than I had planned but I rather include too many than too few."